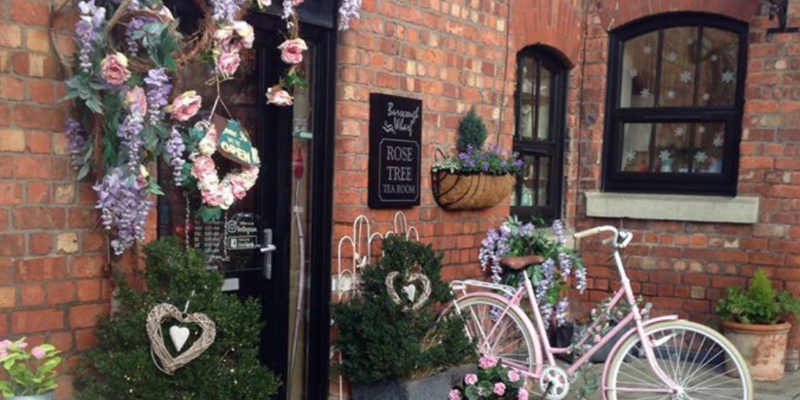 I came across a unique little cafe in Burscough called The Rose Tree Tea Rooms just before Christmas and have been stalking them on social media ever since! They would share pictures of their bright coloured lattes and amazing homemade cakes on their Instagram feed and I just couldn’t wait to visit them. Well, today, me and Jacob finally managed to visit the cute little tea room together, and it certainly did not disappoint. 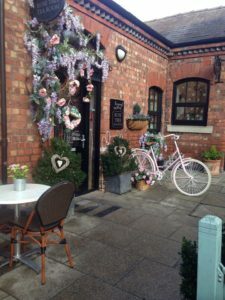 The outside of the cafe is decorated beautifully with pretty pink flowers, little round coffee tables, friendly welcome signs and an old vintage bicycle! When we walked in we were greeted by friendly staff members who showed us to our reserved table. 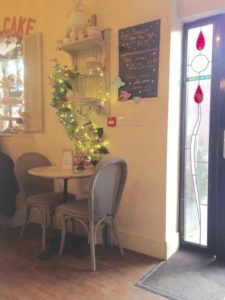 We were given some menus to take a look at and were left for a little while so that we could make a decision, which proved to be much more difficult than I had imagined as there were so many speciality drinks and fresh homemade food to choose from! At first, I was going to order a pot of strawberry and kiwi tea… but then I spotted the specials board and my eyes were drawn to their ‘Terry’s Chocolate Orange Hot Chocolate with cream’ for £3.50 and I could not resist ordering one! The problem with having a sweet tooth! 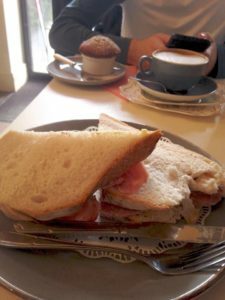 I proceeded to add a bacon butty to my order for £3.95 seeing as it was lunch time and I had not eaten a great deal beforehand. Jacob ordered a flat white coffee (his favourite hot beverage) and decided to take a look at the homemade cakes at the front of the store, before deciding on a fresh blueberry muffin. with delight when we saw how great they looked; especially the hot chocolate! 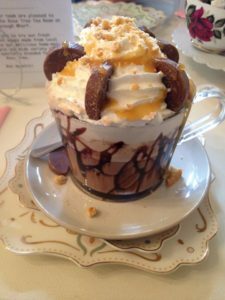 It was in a wide glass mug with chocolate sauce drizzled along the inside of the glass, lots of whipped cream on top, with an orange flavoured sauce and Terry’s Chocolate Orange slices placed neatly around the edge! And it smelt delicious! It looked so perfect that I didn’t want to tuck in and ruin it… so I carefully removed some the slices one by one and cherished their sweet tangy flavour; I even managed to part with a slice or two for Jacob. I imagined the drink to be quite sickly after a while, but it was not that bad at all! It had just the right amount of flavour in it and it was the perfect temperature for me to dive right in. Jakes flat white was a little bit on the hot side, but he said it was delicious nonetheless! The blueberry muffin came presented in a small ceramic dish and was placed on a side plate, which was good considering it was crumbly! I am assuming the muffin tasted nice as Jake finished it in a heartbeat and I didn’t get a look in! Now… the bacon butty is a whole other story. They placed the plate on the table and I sat staring at it for a little while wondering how on earth I was supposed to eat it all by myself. It came on fresh thick cut bread which was very soft, and they were not stingy with the bacon either. I gave it a go but could not finish it… luckily Jacob stepped in to lend me a hand. The tea room was decorated in such a unique manner, with flowers and fairy lights dotted around the room and animal heads on the wall (fake cuddly ones of course! ), there was so much going on with the decor, I could not stop looking around. It was beautiful and the atmosphere was calm and relaxing. While we were sat finishing our delicious food, some more customers arrived and they had an adorable little sausage dog with them! Those of you who know me will know that I have two sausage dogs, so I was so happy when this adorable little fella walked in! I will definitely be visiting this lovely cafe again in the future with my two doggies! Overall this was a very pleasant visit and most definitely worth the wait. I can’t wait to visit again and try their different teas and lattes. The staff were very welcoming and friendly, the food and drinks that we ordered were amazing and the overall feel was very homely and cosy! If you live in the area or are not too far away, I highly recommend a visit!